If you’ve spent a considerable time and efforts in SEO / SEM or digital marketing at large, you’ll understand how hard it is to get traffic to the page you want, leave alone getting the precise clicks that you are looking for. 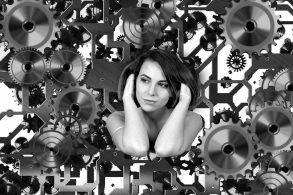 Most of the times, you try to put in more money in expectation of larger clicks and better reach; well, that gives you the SERP clicks, but not really what you were looking for. That’s when you start doubting your digital marketing and targeting skills; atleast we did when we started out! Where are we going wrong? Have search engine gods have unleashed their wrath on us? However, when we dug a little further, we came across some eye-opening lessons that we included in our SEO efforts. And those made the difference in the SERP Clicks for our clients, and for us. How do SERP Clicks work? SERP (Search engine results pages) is what users see when they search for something online. The person enters what they want to search (called as search query). The terms which users enter in the search engines are generally called as keywords (also, the keys of our well-being, if used right – as mentioned by our SEO exec). So, once the keywords are typed in by the user, search engine presents the results matching those keywords. Those are called as SERPs. Here’s an interesting part – If we search for Latest smartphone to buy now in our systems, and someone else searches for the same in theirs; results will be different. Because the search engines customise the user experience and show the results on basis of the location, social media settings, browsing history, and also the device you use. They might look same, but there are minute changes tweaked to suit the user demographics. SERPs contain two types of results – one that is organic, i.e. it depends on the algorithm set by search engine. These are the natural, organic results those are shown to you based on the pure content and popularity. On the contrary, the other type is – Paid results. The content creators / marketers pay for their webpage to be seen on the SERP. SEO person’s aim is to achieve the first one – the websites to ranked higher in the results without paying money; that means, optimising the content. Why? 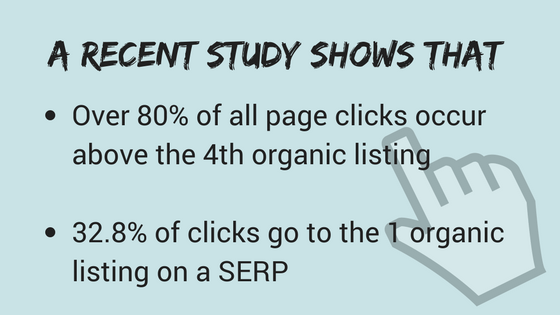 Here are some stats that will help you to understand the importance of organic results in SERP clicks. ONLY 1% of organic search users click to the Next Page. That means – Your page MUST be on a first SERP! 9.9% of clicks on a SERP go to the top sponsored ad. This clearly shows people DO NOT care much for the sponsored ads. And users have become wise enough to understand the difference between paid results and organic results. 32.8% of clicks go to the 1 organic listing on a SERP – This would be clearly the one that tries to help the user as much as possible in when it comes to the query. Dwell time is the period between when the users click on a specific link on a SERP and returning to the SERP after checking the page. Around 2 minute of a dwell time is considered okay. It means that the user found what he was looking for and he spent some time going through the content. However, if it’s less than 2-3 seconds, probably their query is not answered. And if your content is super-amazing, the users might even spend around 15 minutes on the page. If the dwell time is more than 3 minutes, your content is actually amazing. Whereas, bounce rate refers to the percentage of users who visit the website but leave after checking only one page. This refers that the visitor didn’t find your site appealing and / or useful. Time on Page is the amount of time a visitor spends on your website. This can be multiple pages or same page multiple times. All of the above things direct at the utility and ease of use of the page / website. Whenever a user visits your website, the main aim is to get the information that they’re looking for. If their queries are answered on your page, they will stay and even come back when they have similar queries. And if your website doesn’t solve the purpose, they’ll leave. It’s no more a news that mobile searches have increased than the desktop searches. Google stated that more than 77% searches on the website actually answer the call to action. That is if it is searched from the phone, it will convert into the action – buying / booking / ordering / calling / sharing and so on. So it is obvious that the brands who want results should optimise their pages for mobile. Smarphone compatible is not an option. Rather, the websites should take mobile –first approach. Most click activity on phones is for the number 1 organic result. However, it take more time to achieve this compared to the desktop. About 90% of the total clicks were for the pages above rank 4 in the organic listing. So when it comes to mobile, it is crucial to be above 4th. Ads get more leverage on mobile than on desktop. However, the size of a mobile screen should also be taken into consideration while comparing the two. We’d say this again – Good Content. With the search engine algorithms becoming more user-friendly, what you as a content marketer / creator / brand needs to do is create a really good content that is actually useful for the people. Internet users are now smart enough to distinguish between authentic content and marketing attempt. So authentic content creation and wise marketing of it should be focused upon. If you more help on executing it, you can always connect to us. Nice one. I’m learning SEO and this will help me a lot. Keep it up! Thanks for your kind words Mikaela. Let us know how these tips work out for you.